The United States of America is set to partner Lokoja based media, Confluence Cable Network, CCN, owners of CTV and Grace FM towards the development of education in Nigeria, Fresh Angle International can report. This much was disclosed by the United States Counselor for Public Affairs, Aruna Amirthanayagam in Lokoja, Kogi State when he led his team on a courtesy call on the Managing Director of Confluence Cable Network, Simbabi Ogbeha. 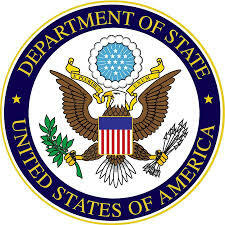 Our Kogi State Correspondent reports that the US Embassy is currently sponsoring a radio program on Grace FM, Lokoja titled ‘Greetings from America’ which gives travelling opportunities to those who wish to further their education (Degree and Master’s programmes) abroad. Amirthanayagam said their mission was to improve the educational links between United States and Nigeria, noting that the embassy had offered scholarship programmes to Nigerian Students who could not afford tuition fee in all fields of study. The Managing Director, Confluence Cable Network, Simbabi Ogbeha thanked the U.S Embassy in Nigeria for patronizing Grace 95.5FM, expressing delight that the audience of ‘Greetings from America’ are now enlightened and have shown interest in the programme through their participation.